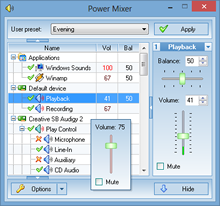 Free Download Power Mixer 2.10 - Complete Windows volume control replacement. Power Mixer gives you full control over your playback and recording devices. If you find standard audio mixer of Windows awkward, not sufficient, or simply boring, this may be the right utility for you. Power Mixer offers you a complete volume control replacement with rich additional features. For example, it is possible to adjust volume with mouse scroll wheel. Advanced controls like bass and treble are also available. The program can use customizable system wide hotkeys that allow you to control sound devices easily from any application, including games. On-screen display (OSD) feature provides you with nice visual feedback, so you are able to adjust volume even if no sound is played at the moment. Frequently used settings can be saved in presets. Number of possible presets is limited only by your imagination. Different presets for music, movies, games, evening time etc. may prove to be very handy, allowing you to switch from one sound configuration to another without any hassle, by pressing a simple combination of keys, or by clicking a mouse button. If you prefer automated switching, there is a built-in scheduler and command line support. Power Mixer can be even more helpful if you have multiple sound cards on your computer.